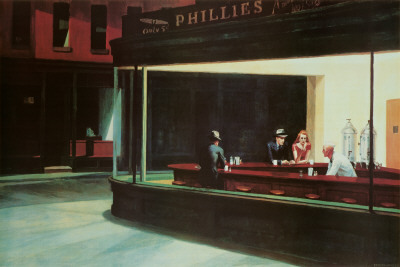 American painter Edward Hopper famously painted melancholy images of alienation in daily life. His stark urban and rural scenes are eerily realistic, depicting desolate structures and painfully isolated people. A skilled watercolorist and printmaker, Hopper was primarily known for his oil paintings. Although he dreamed of being a Naval architect, once he discovered painting, he achieved quick fame and soon became America’s leading Realist. His grim scenes, mainly of New York and New England, were emphasized with severe lines, shapes, colors and angles and his later works revealed similarities to geometric abstraction. "Maybe I am not very human - what I wanted to do was to paint sunlight on the side of a house." Edward Hopper by Carol Troyen, Judith Barter, Elliot Davis, and Edward Hopper; Silent Theater: The Art of Edward Hopper by Walter Wells; Edward Hopper: An Intimate Biography by Gail Levin; Edward Hopper by Lloyd Goodrich; Edward Hopper: Summer at the Seashore (Adventures in Art) by Deborah Lyons and Edward Hopper; Edward Hopper: 1882-1967, Vision of Reality (Big Art S.) by Ivo Kranzfelder; Edward Hopper: Painter of Light and Shadow by Susan Goldman Rubin; Edward Hopper's New York by Avis Berman and Edward Hopper. Available here are these Edward Hopper posters and prints, among others: Nighthawks, Rooms by the Sea, Early Sunday Morning, Room in New York, New York Movie, Gas, Lighthouse - Porthead, Lighthouse at Two Lights, The Long Leg, The Lee Shore, People in the Sun, Office at Night, Cape Cod Morning, Hotel Room, Summer Evening, Room In Brooklyn, Chop Suey.